With its “Smart System Optimization“, Fraunhofer IPA has developed a tool that identifies errors in interlinked manufacturing systems and shows their root causes. In order to do this, high-performance machine control connectors and external sensors such as smart cameras record relevant process characteristics. Subsequently, an analytical tool interprets the data in real time. This means that fully automated production systems with short cycle times can be optimized while also enabling automated machine benchmarking of comparable machines. The analytical tool will be presented at HANNOVER MESSE USA, co-located with the International Manufacturing Technology Show (IMTS) in Chicago from September 10 to 15, 2018. Complex and capital-intensive manufacturing systems, companies must always maximize productivity. However, many manufacturing systems encompass a variety of stations and work so quickly that sources of errors can no longer be manually identified. In a survey of 147 participants, Fraunhofer IPA determined that there is a high demand for a solu-tion to optimize interlinked systems. Project manager Felix Müller confirms: “The more complex the system, the lower the productivity.“ He adds that the pharmaceutical and consumer goods industries are particularly affected. (PLC) in high frequency. If the PLC-data is not sufficient smart cameras also record the relevant process characteristics “from the outside“. This creates a continuous data stream that is synchronously transmitted to the big data analytics tool. This can then draw con- clusions with the aid of the algorithms, give a feedback in real time to operators and prepare the information in the desired form. The tool also works out how to link the errors and can prioritize them. It is suitable for automated machine benchmarking too. This means that all machines in a fleet can be brought to the highest possible level. Fraunhofer IPA has already implemented the tool in industry several times. 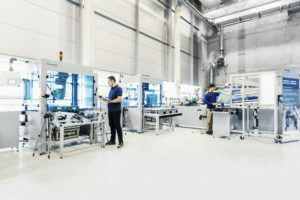 At SCHOTT Schweiz AG, the overall equipment effectiveness (OEE) was increased by around 10% for a highly automated production system manufacturing syringes. At Freudenberg Sealing Technologies (FST), the researchers implemented the interlinked machine benchmark, leading to a reduction in cycle time of up to 10% per machine. Currently, Fraunhofer IPA researchers are working on expanding the sensors of the Smart System Optimization and developing algorithm packages for short term failure prediction. They also plan to make the connector available for even more machine controllers, allocate currently unrecognizable errors in an automated way, and make error images comprehensible for production employees, in real time.